There are few things more prosperous than feasting on a whole roasted chicken at a reunion dinner. 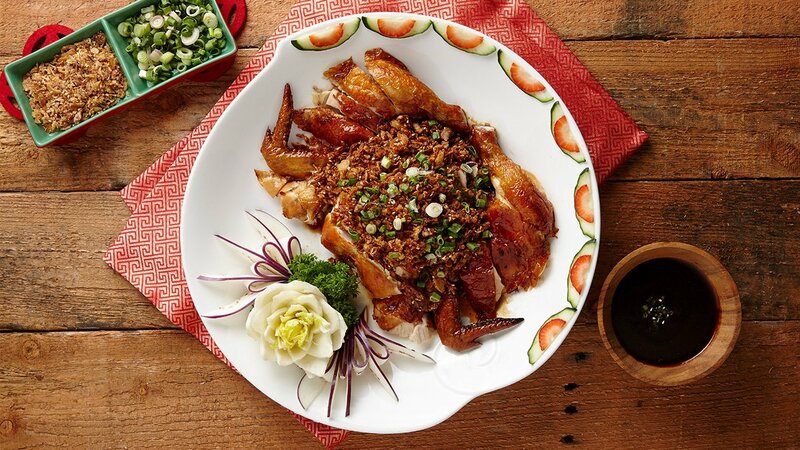 Include this roasted delight in your Chinese New Year menu and indulge diners with a dish that tantalises with a rich mix of Knorr Italian Herbs, chili, garlic, shallots and dark soy sauce. Mix the ingredients well, set aside. Blanch chicken and strain dry. Dye chicken with colouring. Brush chicken’s stomach with marinade and hang to air dry. Set aside. Preheat the oven to 160°C, roast air dried chicken for 28mins. Portion whole chicken into pieces. Pour seasonings A on a plate, place chicken parts on sauce. Add fried shallots, fried minced garlic and sesame seeds to seasonings B and mix well, drizzle the sauce onto chicken. Garnish with spring onions and serve.